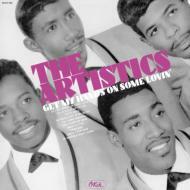 The Artistics Okeh album, Get My Hands On Some Lovin' makes it for the first time onto CD. Great Chicago soul production by Carl Davis from the mid sixties. Whilst only 10 tracks it represents their best album on Okeh records. This is a limited Japanese paper sleeve edition. Issued on Okeh MHCP859 Japan.